District play kicked off in the remaining 11-man classes this week and with it came some intriguing match-ups of unbeaten teams. Let’s start with the fan’s choice for the Kpreps Game of the Week; Class 3A’s No. 1 Beloit Trojans traveling to take on No. 5 Phillipsburg. Expectations for this game were high as Beloit rallied from down 15 in the first half last season to win 32-27. Friday’s showdown would feature the Trojans and Panthers trading touchdowns for much of the night. Beloit took a 16-7 lead early in the second quarter as Bowe Behymer broke free for a 16-yard run, but as they did all night, Phillipsburg would answer to pull within 16-13. Beloit extended its lead to 24-13 on a Payton Vetter touchdown run, but the Panthers would again answer with :53 seconds remaining in the half to pull within 24-20. Vetter would score from 70 yards out to start the third quarter and put Beloit up 32-20. The teams would again trade touchdowns with Beloit leading 40-27 and Phillipsburg threatening to score again. On fourth-and-goal, Beloit’s R.J. Jackson came up with a huge sack to turn the Panthers away with 11:20 remaining in the game. The Trojans then did what top-ranked teams do. They drove the length of the field, taking some nine minutes off of the clock and iced the game with a touchdown to win 48-27. Beloit was able to convert all six of its two-point conversion attempts on the night. The other feature game in the state pitting top-ranked teams took place in Class 4A where No. 2 Andale went on the road at No. 4 Buhler. After a scoreless first quarter that saw Andale turned away on downs and fumble through the end zone, freshman Anthony Capul broke a 55-yard touchdown run to put the Indians up 6-0. Buhler’s Denton Branscom, playing tailback for the injured all-stater Riley Allen, scored his first touchdown run of the night to put the Crusaders up 7-6. Andale would respond as Hunter Knoblauch scored from 16 yards out and the two-point conversion gave the Indians a 14-7 lead at halftime. Branscom added a short touchdown run in the third quarter that sent this showdown into the fourth quarter tied at 14. But Branscom was injured early in the fourth quarter and did not return. Buhler took to the air and Jace Williams hit Luke Berblinger on a touchdown pass to give the Crusaders a 21-14 lead. Andale would come back behind senior quarterback Jared Smarsh. Smarsh broke a 48-yard touchdown run to pull within 21-20, but the Indians were stopped short on the two-point conversion attempt. Smarsh would score again with just under seven minutes remaining and Hank Eck added the two-point try to give Andale a 28-21 lead. The Indians threatened to extend their lead late in the game but fumbled deep in Buhler territory for the second time. In the end Smarsh’s big fourth quarter proved to be enough as Andale won 28-21. Elsewhere in Class 4A, top-ranked Holton hosted undefeated Wamego. The Wildcats made quick work of the pass-happy Red Raiders turning a pair of first-half interceptions into points and rolling to a 56-6 win. Senior running back Drake Ewing rushed for four touchdowns in the first half as Holton built a 42-6 lead. The Wildcats will travel to Topeka Hayden next week to continue district play. Hayden shutout Royal Valley 21-0 in the other half of 4A District 9. Entering Week 7 there was only one remaining unbeaten team in Class 6A. Now there are none. Manhattan topped No. 3 Topeka High 22-7 to win a share of the Centennial League championship with the Trojans. It marks the fifth consecutive season the Indians have won at least a share of the Centennial League crown. 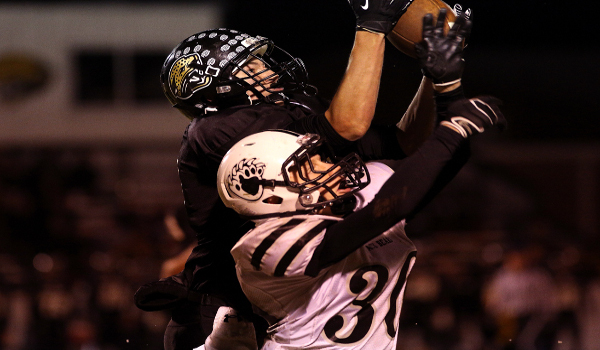 For Topeka High, the second consecutive share of the league title is bittersweet given this marked their first loss of the season and places them in a tough place with a pair of 5-2 teams remaining on the schedule in Washburn Rural and Junction City. In Class 2-1A, La Crosse got an early scare from Sterling before pulling away for a 30-14 win. The Black Bears grabbed a 14-0 lead on the second-ranked Leopards at the end of the first quarter. La Crosse would pull within 14-8 at halftime and eventually tie the game at 14 mid-way through the third quarter. The Leopards then scored two more times to beat Sterling and take control of the District 5 race. Pittsburg High fell from the ranks of the unbeaten in Class 5A with a 56-35 road loss to Blue Valley West. The Jaguars led the Pittsburg 31-7 before a furious rally got the Purple Dragons within 34-28. Pittsburg then recovered a Blue Valley West fumble on a punt return and had the ball at mid field. However Cale McMakin registered a huge sack of Pittsburg quarterback Riley Cunningham that took the Dragons momentum away on offense. The Jaguars scored mid-way through the fourth quarter to extend their lead to 42-28, but Alex Barnes would score from a yard out on fourth down to get Pittsburg within 42-35. Blue Valley West would tack on a pair of late touchdowns to win by 21 points. Kiowa County solidified their hold on the No. 2 ranking in 8-Man, Division I with a 50-0 shutout of Fairfield. The Falcons came into this game at 5-1, but did not have an answer for Maverick quarterback Trever Powell. Powell carried 21 times for 338 yards and six touchdowns to pace Kiowa County. The senior improved his season rushing total to 1,669 yards and 25 touchdowns. Mike Jones rushed for nearly 300 yards and five touchdowns as Salina South outscored cross-town rival Salina Central 55-27. Marais des Cygnes Valley handled Uniontown 70-22 in a game featuring two teams that entered with 5-1 records. The Trojans used another big night from senior Kaden Vanderpool to eclipse the 70-point mark for the second time this season. Vanderpool rushed for more than 250 yards and four touchdowns on the night. He also caught a touchdown pass and returned a kickoff 78 yards for a sixth score. Caleb Dickey helped the Trojans by intercepting two passes – one of which he returned for a touchdown.